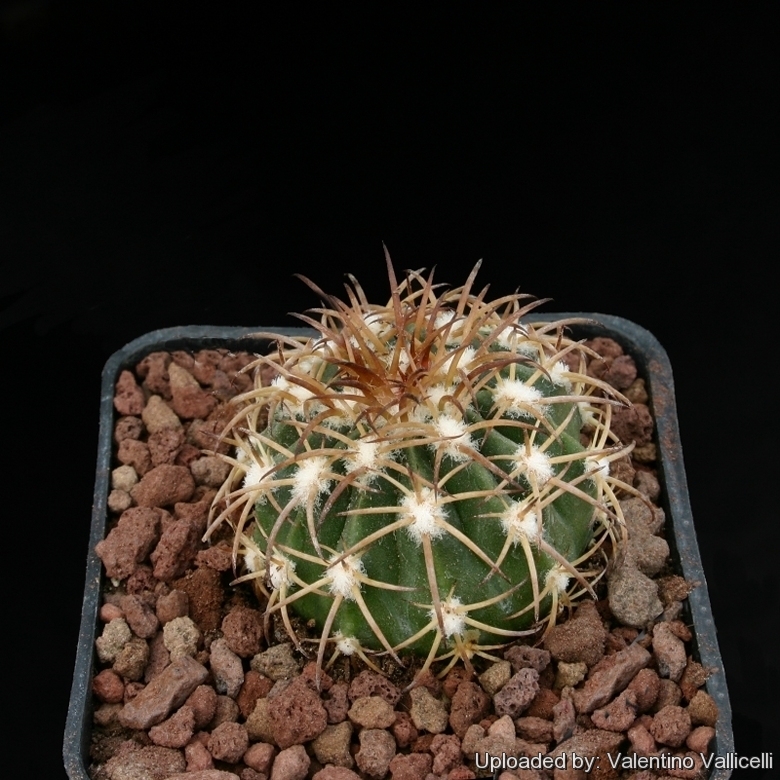 Description: Melocactus pyramidalis is one of the several morphological forms of Melocactus macracanthos which is quite variable and has received numerous unnecessary names of no botanical value, representing no more than local phenotypes. 4 M. PYRAMIDALIS (Link et Otto, diss. p. 10. t. 25.) plant conical or pyramidal, with 17 angles; ribs rather oblique, crenated ; spines very long, in fascicle, of a brownish red colour: outer 14 radiating in 2 series, with 2 or 3 straight and very long. D. S. Native of Curassoa. Cactus pyramidalis, Salm-Dyck, obs. 1820. p. 4. Stem when young crowded with spines. Spadix or woolly head cylindrical, depressed at the apex. Pyramidal Melon-thistle. Shrub 1 foot. Remarks: It is possible to find in cultivation a form of Melocactus pyramidalis raised from the seeds distributed by Karel Kníže (field number KK567 Casma Desert, Peru Altitude: 1200[600?] m asl), but plants from this locality may be more likely referred to Melocactus peruvianus. Cultivation and Propagation: These tropical cacti are not the easiest things to grow and aren’t plants for beginners. Growth rate: It is a relatively rapidly growing given the best conditions. Repotting: The root system is weak and generally resents being repotted and can take a long time to re-establish. Use pot with good drainage. Light: They preferes very bright light, not as much as the most arid growing cacti, but plenty nonetheless. Tends to bronze in strong light, which encourages flowering and heavy spine production. Watering: Melocacti grow from April to October and cannot endure long stretches of total dryness, and also too much water will rot them, as their weak root systems tends to be inefficient at sucking up water from wet soil. Nonetheless, again as a result of their tropical origins, they need a fair amount of water, but allow the soil to dry quite a bit before watering again. - Mealy bugs: Occasionally mealy bugs develop aerial into the new growth among the wool with disfiguring results, but the worst types develop underground on the roots and are invisible except by their effects. Propagation: Exclusively by Seeds. Sow in February-march in a light, sandy, porous soil. Cover germinating tray with glass to prevent seed from drying out. Germination is most successful at a temperature of 18 to 22° C.